You are amazing, mama. Over the past 9 months you've grown and nurtured another human being, how mind-blowing is that? As you gear up and prepare emotionally and physically for becoming a mama, I want to remind you and encourage you to also prepare to tend to and nourish yourself in the coming months. Your body naturally goes into a massive healing mode in the few weeks postpartum. I want to help you reap all the benefits of this healing mode, so you can feel your best, look your best, and mama-bear your best. In Traditional Chinese Medicine, we believe the postpartum time is a time of amazing healing potential and with the right postpartum care, you can preserve and support your health and vitality for feeling your best and aging gracefully over the decades to come. We believe food is central to postpartum healing. It's important to eat nourishing foods designed to help you recover from pregnancy and birth, and encourage successful breastfeeding and a stable mood. The heart of this postpartum healing time is nourishing the new mother. Eating healthy and specific foods is central to this. But I know this can be the first thing to be sacrificed when time, energy, and resources are scarce. Taking a few pre- or post-natal vitamins won't do the job. Your daily meals truly do the job of nourishing and rebuilding you. That's where this meal plan comes in. This meal plan will make it easy for you. 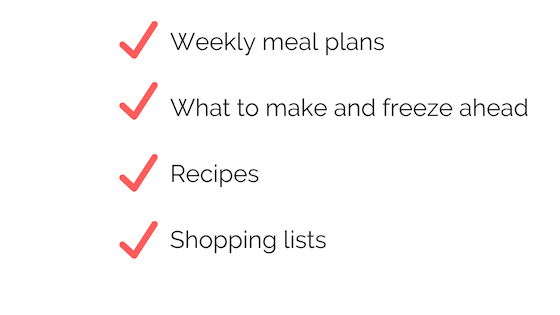 It will help you (and/or your partner, friends, and family) decide exactly what food you should eat, how to prepare, what meals to stock your freezer with. It will give you weekly shopping lists and recipes. So you can focus on your baby, not stress about food, and feel confident that these nutrient-dense, healing dishes will be comforting, delicious, and will set you on a path to healthy and energized parenting, recovery, and life. You'll get recipes for healing foods, replenishing meals and snacks, and warming, calming and lactation-boosting recipes. 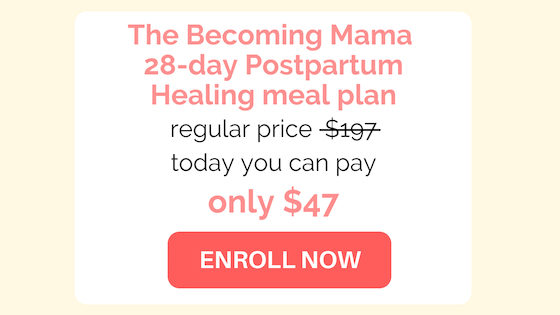 The Becoming Mama Postpartum Healing Meal Plan is a 28-day meal plan. It's an eBook that you can easily download. Week 1 is formulated to rebuild iron and mineral stores, with lots of protein, antioxidants, and collagen to support tissue repair. Week 2 continues the goals of week 1, but with slightly less meat and iron. Week 3 is designed to support your milk supply, with galactagogues and therapeutic foods to boost milk supply and flow. Week 4 targets progesterone and estrogen balance and liver detoxification pathways, to help stabilize your mood. Food is medicine and information to your body. I've designed the meal plan to incorporate all the healing foods that will optimally support you during this time. As well as to be delicious and low-fuss. I've done all the research and planning for you, so you don't have to! You can focus on all those delicious baby parts to be kissed.